This is more of a how-to assemble this rice bowl than a recipe, but Korean hwe dup bap is one of my comfort foods so I decided to put it up. Just like the Japanese chirashi, all you need is sashimi-grade fish on top of rice, and typical me, I put both versions together. I don’t have exact measurements either because I make the faux sushi rice per serving and I just estimate the right ratio of rice to the mirin-sugar-salt mixture. 1. Make the sushi rice. Combine the rice vinegar, sugar, and salt in a small bowl. In a separate large bowl, combine your freshly cooked rice with the vinegar mixture and mix well. 2. Make the sauce. In another small bowl, combine the kochujang paste with soy sauce and sesame oil. Whisk to dilute the paste as much as possible. 3. Assemble your rice bowl. 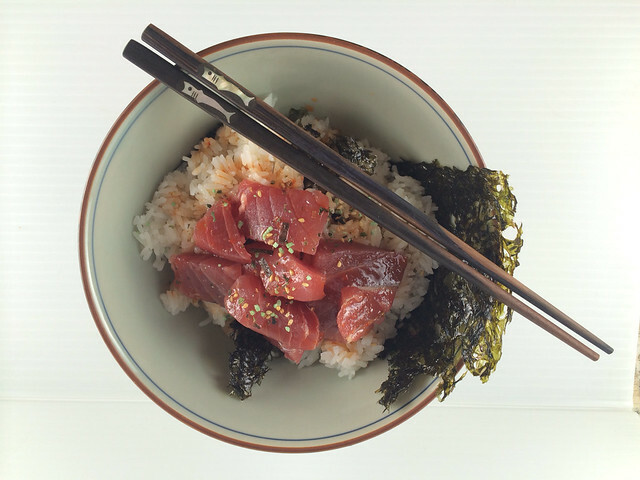 In a bowl with a serving of the rice, drizzle in the kochujang sauce and top with the tuna. Drizzle a little bit more sesame oil and sprinkle with togarashi. Serve with nori on the side.